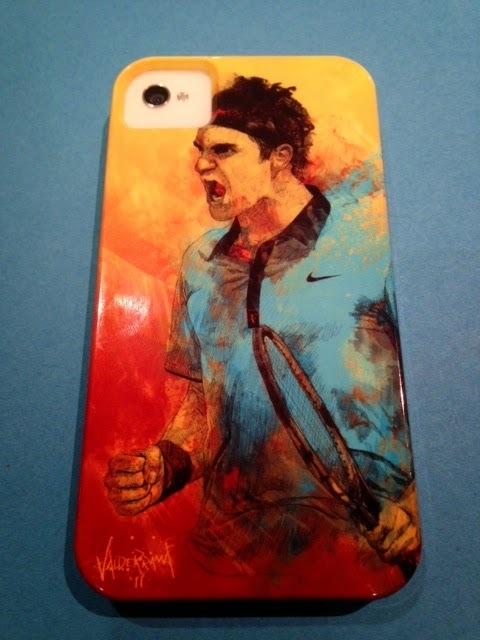 Anyone who knows me well knows that I am a tennis lover, but beyond that, that I am one of the legion of passionate fans of Swiss star, Roger Federer, so much so that my iPhone case has his image on it! When she found out I would be living in Neuchâtel this year, my sister suggested I ought to go to the Davis Cup semi-finals in September and see my idol and his teammates take on the Italians. At the time, I thought that would be impossible for many reasons, and dismissed the idea. 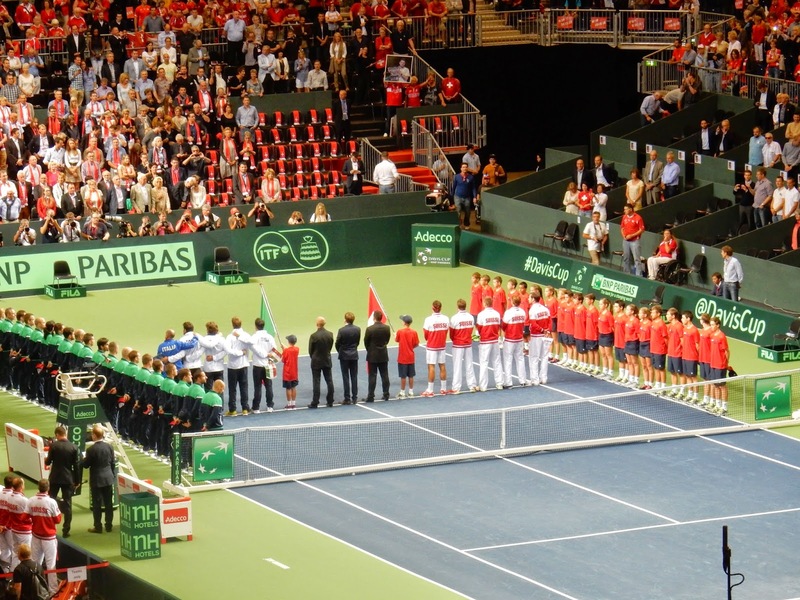 The Davis Cup, a competition among tennis players representing their countries, takes place over a weekend, starting on Friday afternoon, and concluding on Sunday. Under normal circumstances, as a teacher, I would not be able to even consider attending Friday matches, but my timetable this semester is only part-time with my classes ending at 10:50 on Friday mornings. This meant I might be able to get myself to Geneva for the event after all - if only I knew how to get tickets. Enter Lyn, one of the staff here, also a Federer worshipper. She had attended Davis Cup matches in the past and was eager to do so again this month. She knew how to get tickets. She also had other friends who might be interested in going to the event. By Tuesday night, thanks to Larry, we had secured four very pricey tickets to the first day of the semi-finals of the Davis Cup! I could not believe my luck. Lyn,Larry and Pat, my companions for the day. The wonderful Dan Martin covered my class for the last 20 minutes so that we could make the train to the Geneva airport. I had dressed in my red and white Canada Day shirt and my red jacket for the occasion, and on the platform, I fit right in. 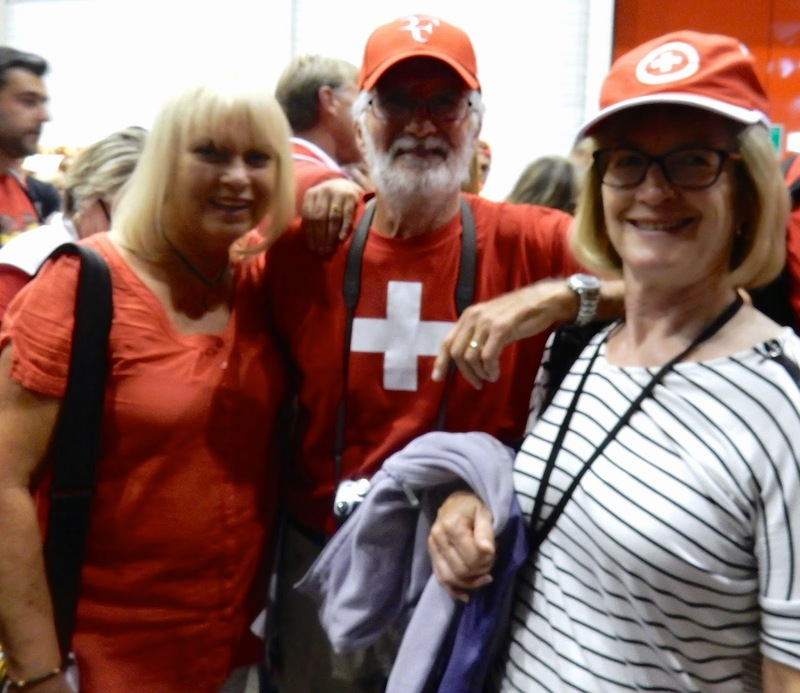 There were red and white attired Swiss fans everywhere! 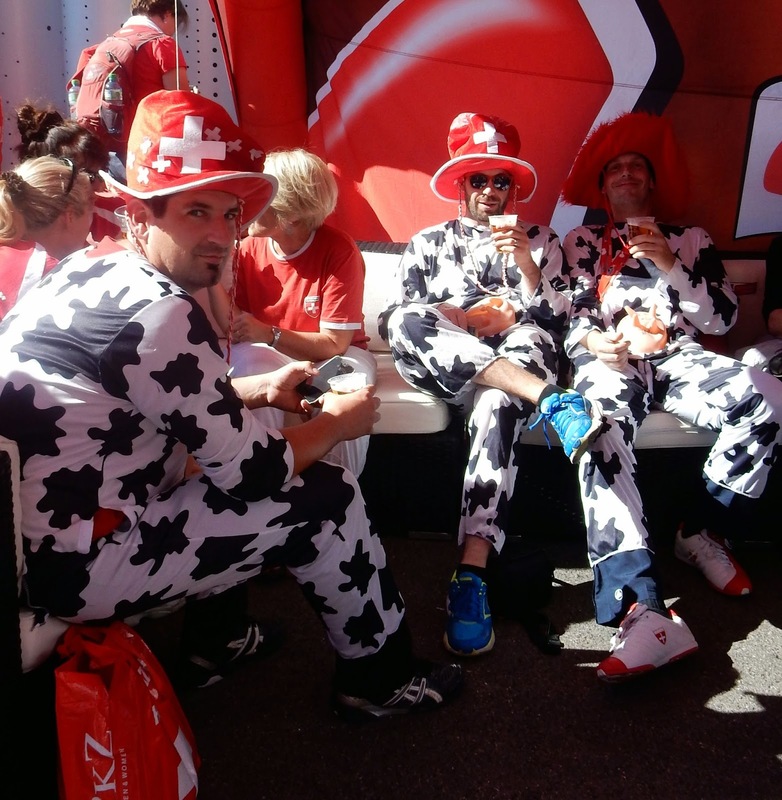 In Geneva the atmosphere was festive. 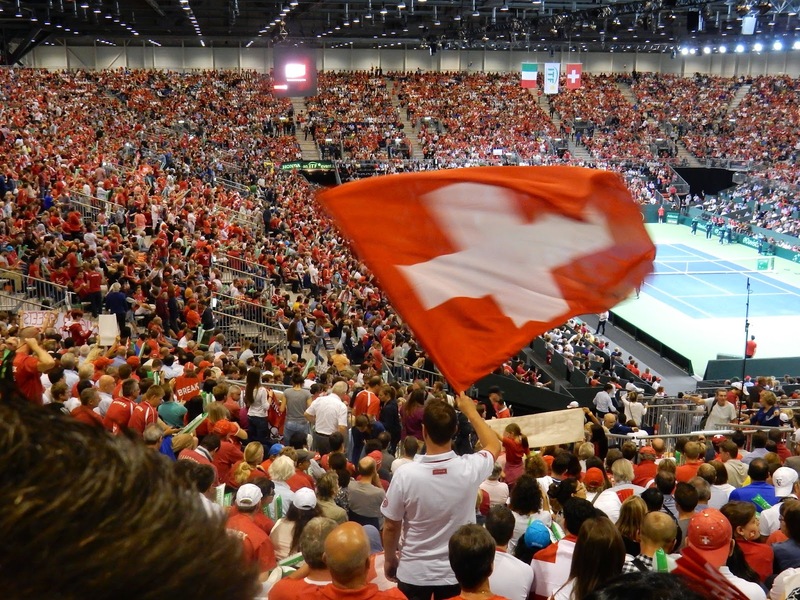 With Roger Federer and Stan Wawrinka ranked third and fourth in the world, respectively, the Swiss were the strong favourites. 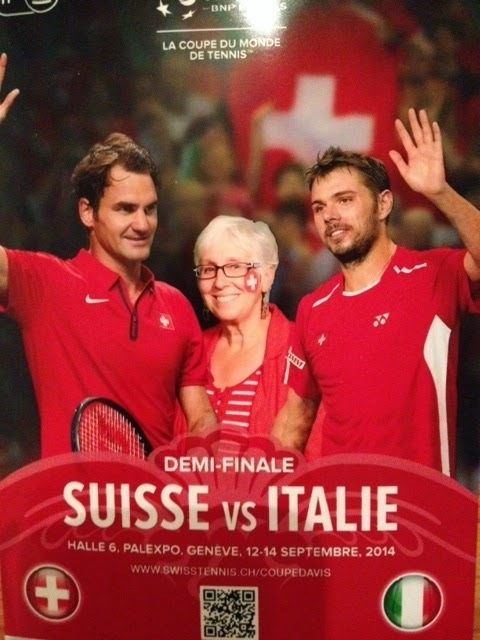 This was a day to proudly wear - and wave - Swiss colours. While entry into the stadium was expensive, I discovered that many of the extras we pay for at tennis matches in Canada were included in the cost of a ticket. I was given a program (in French), some noisemakers, and a sign to hold up; I also queued to get my photo taken with the stars of the day. 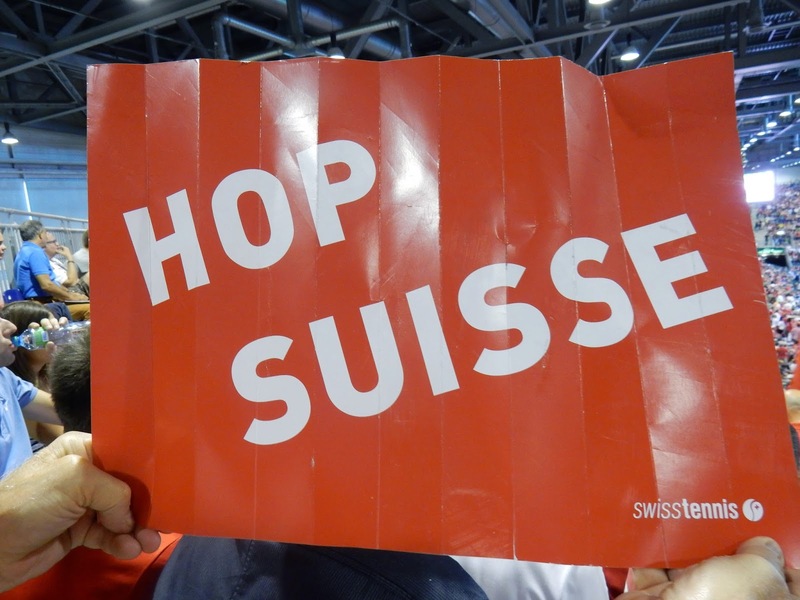 This is the local cheer, meaning "Go Switzerland". On the reverse side is a single word: BREAK. 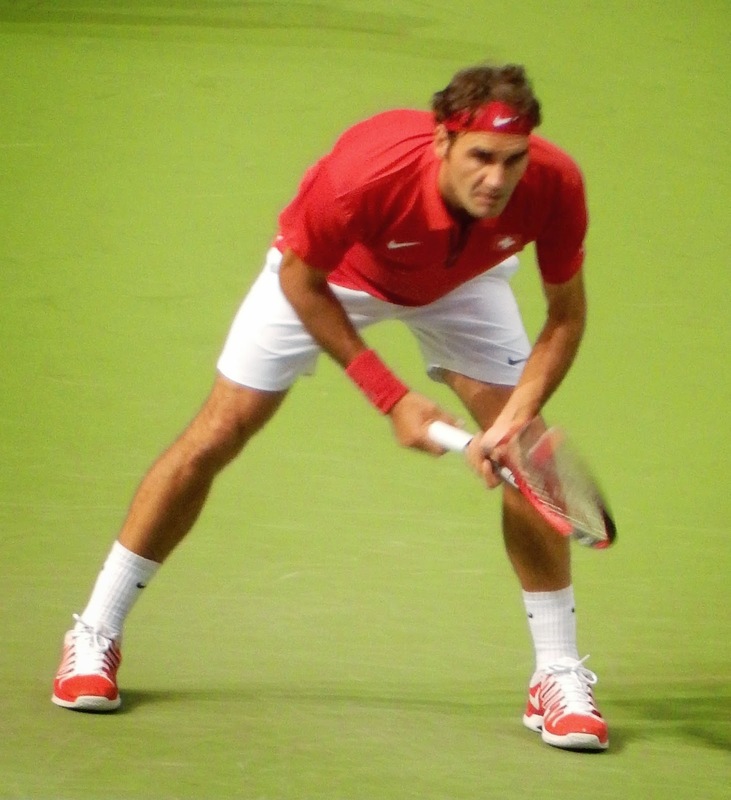 Roger Federer played Simone Bolelli first; it was a good match - close - but my man prevailed in three sets, 7-6, 6-4, 6-4. Roger looking sharp in his Nike "Swiss" shirt. 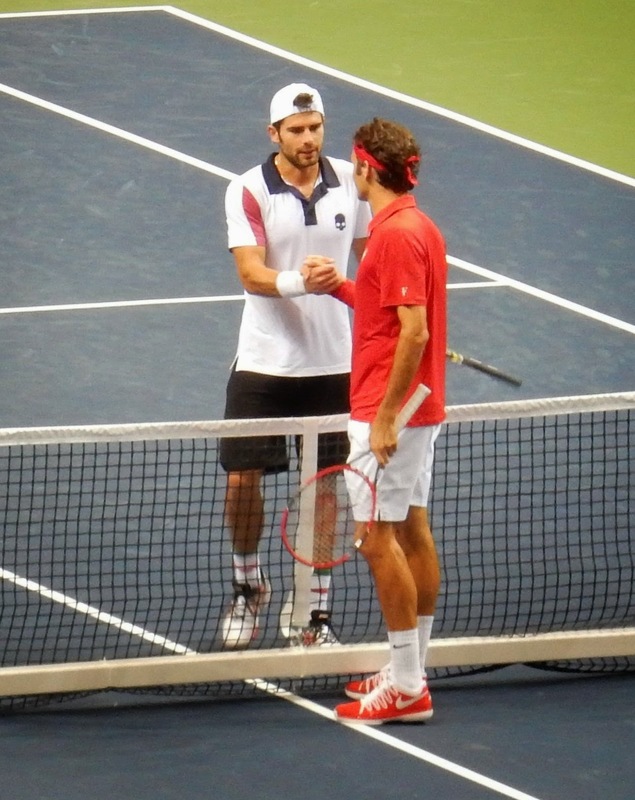 Bolelli shakes hands with the legend after losing the match. It is interesting that the Italian did not wear a blue shirt. 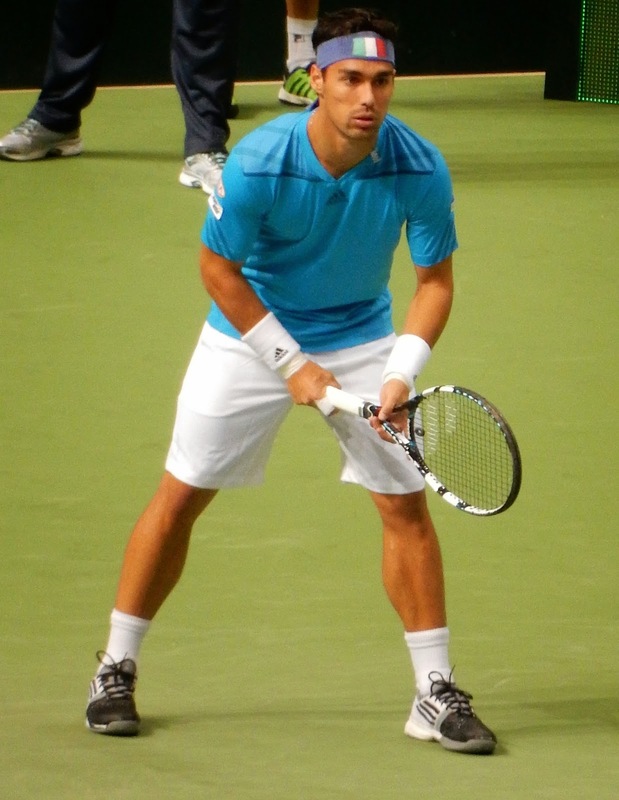 Stan's match against the volatile Fabio Fognini was not close at all. The Stanimal was on fire on this day and won 6-2. 6-3, 6-2. 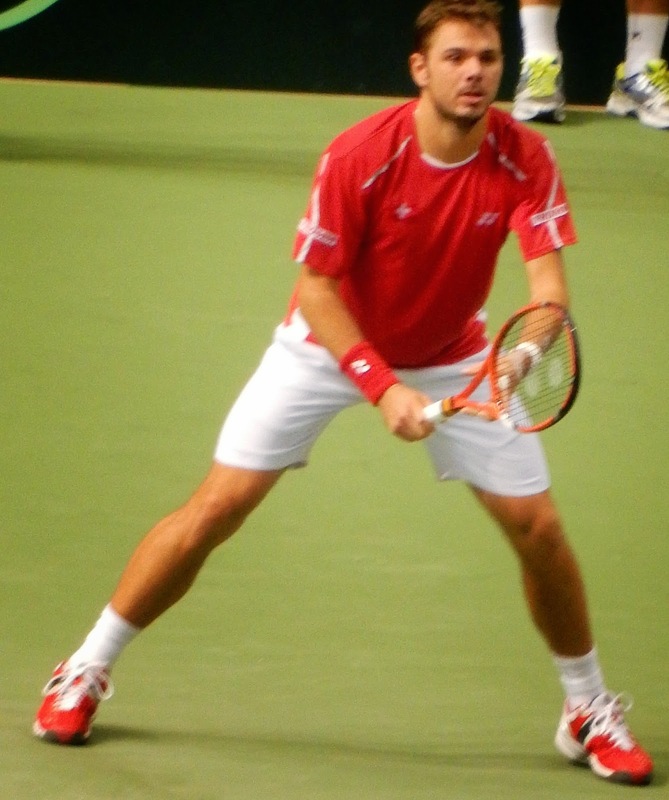 Stan in his Yonex shirt. Fabio wears his Italian colours proudly. By 18:30, the day was over and 18 000 happy fans trailed out of the building. I tasted my first raclette on the way out; within an hour, we were on the train back to Neuchâtel, pleased to have been part of a special day. I saw some of the other matches on TV on Saturday and Sunday. The Italians won Saturday's doubles in a tightly contested five setter, while on Sunday, Roger was back on the court, this time against Fabio Fognini, where he prevailed in three sets, clinching a berth for his team in the finals against France in November. By the way, over the weekend, Canada won their Davis Cup tie as well. My red and white colours worked back home too!